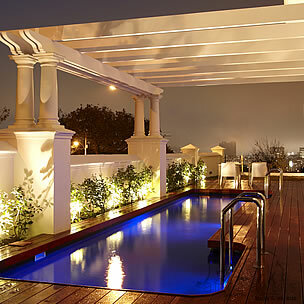 MannaBay Fine Boutique Hotel at the foot of the Table Mountain is Cape Town's latest and most elegant boutique hotel. In the heart of Cape Town, seven uniquely designed suites set the bar for contemporary luxury. From the imperial indulgence of the Versailles suite to the acts of pith-helmeted derring-do which inspired the Explorer room, MannaBay is synonymous with timeless elegance and modern luxury. All the magnificent bedrooms have state-of-the-art flat screen TVs with a variety of satellite channels - you might also want to take advantage of the extensive DVD collection, or iPod docking stations. All rooms are fully air-conditioned and have underfloor heating if it gets a little chilly. In the opulent, white, marble bathrooms, you'll find indulgent Moya products which use uniquely South African ingredients such as Rooibos and the essential oils of indigenous Cape Snowbush, Buchu, and Blue Mountain Sage. But it’s the imagination of the interior design at MannaBay which will really catch your eye, where intriguing furniture and exquisite art work abound. The space and views are unsurpassed and with just seven suites, MannaBay offers one of the most intimate experiences available in the fairest Cape. We’ve assembled a warm and professional team from the butlers who will tend to your every whim to the meticulous housekeeping staff. MannaBay is situated in a safe and affluent neighbourhood and has a state-of-the-art 24hour security system as well as a secure garage with direct access to the hotel. 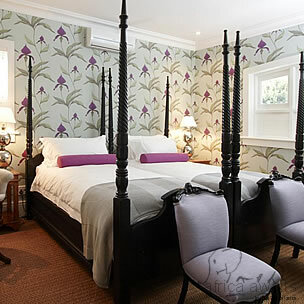 Guests might delight in roaming the enormous ante-rooms and ornate lounges before catching a few rays on the vast wooden sun deck or swimming beneath the splendour of Table Mountain as the bright, African sunlight pings off the azure water. There is a library rippling with African travel literature and home to an enormous television, ideal for catching a game of sport or watching a DVD. There’s also a writing desk and a laptop with full internet access for those who need to catch up with the outside world. The team at MannaBay is dedicated to optimising every guest's experience – nowhere will this be more apparent than at the breakfast table. Breakfast is a decadent and indulgent affair crammed full of fruits, cheeses, freshly squeezed juices, Africa’s finest single roast coffees, freshly baked breads and of course a mouth watering selection of hot dishes. 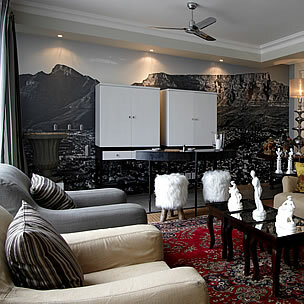 With your holiday, safari or business trip from in to MannaBay Fine Boutique Hotel in Cape Town.